Make no mistake; this is no "SEO for dummies". 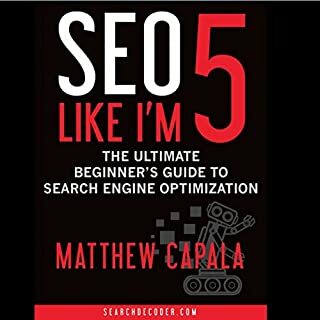 Rather, SEO Like I'm 5 is the ultimate beginner's training system for forward-thinking businesses and entrepreneurs that will get you found on Google, social media, and blogs. You will also learn how to attract followers and leads like a magnet by building a vibrant community around your content, which both users and search engines will love, and leveraging untapped, high-growth platforms and social networks. Would you try another book from Matthew Capala and/or Andrew J Mason? there are lots of lists in this bood and suggested websites - would be really great if a companion PDF was offered for reference.